The race was held last Saturday, 11th December 2010 at Miri. The race was simple and happy go lucky. Just like Panaga Triathlon. The duathlon race is 1km run, 17km bike and 5km run. The Ultimate prize of the day !!! The three of us join the race and we decided to wear Powerbar T-Shirt. We were the only Bruneians joining the race except maybe for a few expats from Panaga.The race was a handicapped race whereby your starting position will be based on your prediction time of 5km run and 17km bike. My prediction time were 28 mins for 5km run and 31mins for 17km bike. The slowest goes first and elite goes last. According to our BIB number, Ali will start first then Zaeidi and me. The starting interval is not fix. Some 1 minute, other 3 minutes and even 5 minutes, maybe !!! The race started around 7:15am and Ali started his 1km run around 7:34am and at 7:41am he is on his way for the 17km bike ride. 7:39am, BIB number 41 (zaeidi), 42 and 43 (ME) were flagged off at the same time, maybe due to our almost same predicted time. It is a 1km run, So I decided to make the pace a bit more faster 4:00min/km. 42 & 43 for the first 200m was side by side while 41 was drafting at the back, trying to follow the pace. Then 42 drop his pace, so 43 took the lead and increase the pace. I guess at one time the pace was 3:30min/km. Everyone was in a single file 43,42 and 41. 7:44am, after T1, no 42 managed to do a quick transition and he disappeared with his bike and never to be seen. Zaeidi tried to catch him but he was way to fast for him. I think he doesn’t want us to draft behind him just like the run. I finished the race within my predicted time. 17km bike with a time of 32:37 mins (predicted 31mins) and 5km run 27:51mins (predicted 28mins). On the bike leg, 2 cyclists managed to catch me and on my 5km run, I guess around 4 runners managed to catch me. I’ve only managed to overtake maybe 2 or 3 athletes. By 9:45am, We are already safe back to our hotel. Until next time. 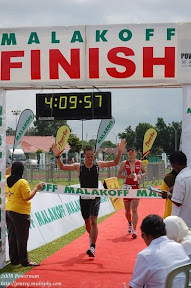 Next year, Powerman Malaysia - November 2011 – 11km run, 64 km bike and 10km run. easy bah !! !